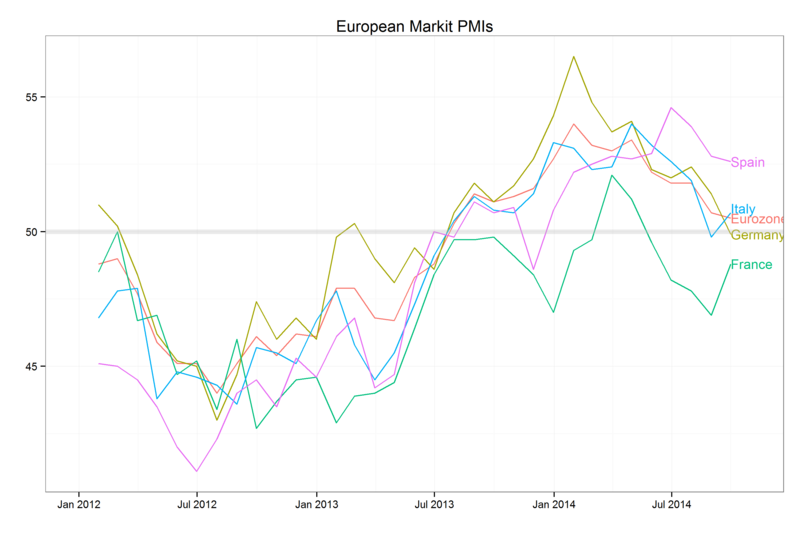 We began registering concern about Eurozone growth in July and the latest numbers do not ease our concerns. 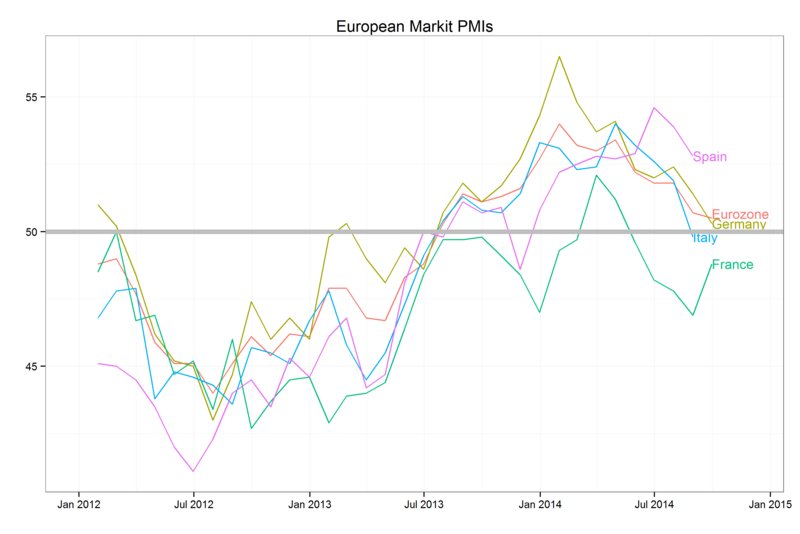 Italy dropped below the 50% growth / contraction line with the August release. France may have stabilized but if so it too is below 50%. The PMI for the Eurozone as a whole is also close to the line suggesting shrinking manufacturing activity and has not increased since April. To highlight the European trends we break them out in a second chart below. This chart reveals that while improvement we saw around the new year seems to have reversed, the Eurozone is not seeing the sorts of deterioration in manufacturing as was seen just 18 months ago. The European bond and currency markets, however, are reacting more dramatically than they did in 2012, perhaps because the ECB seems to be more worried this time. North America seems to be a bright spot. The US has the highest reading overall and Canada and Mexico are both solidly above 50. 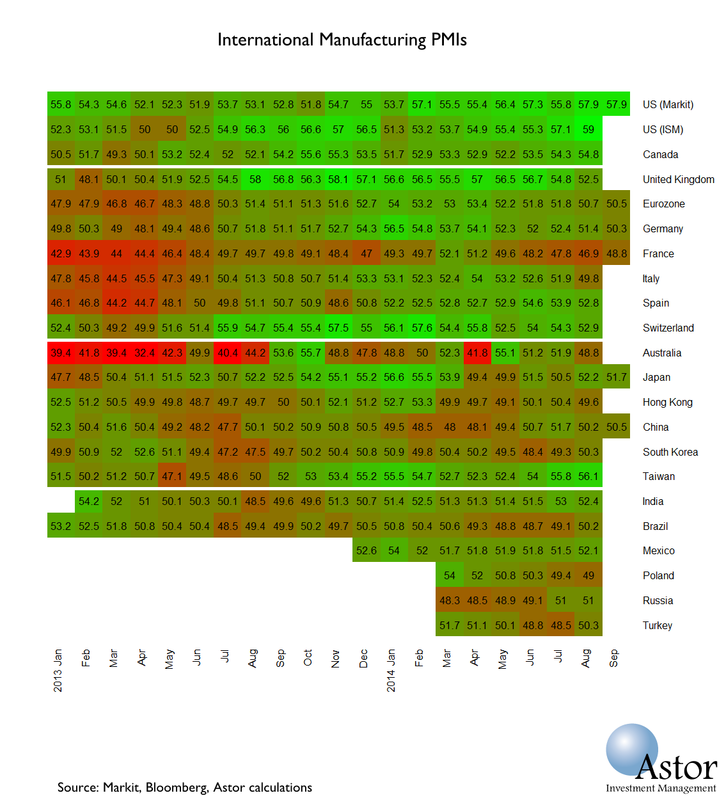 Asian PMIs are mainly around 50, though Taiwan, enjoying a new high, being an exception. All the new iPhone parts? When the FOMC meets next week the big question is whether the forward guidance on the future path of interest rates will be confirmed or changed. To refresh your memory, the Fed has been taking two unusual actions over the last few years. First it has engaged in quantitative easing by buying treasury and MBS bonds in the market. Second it has tried to assure the market that it was not going to raise rates any time soon. 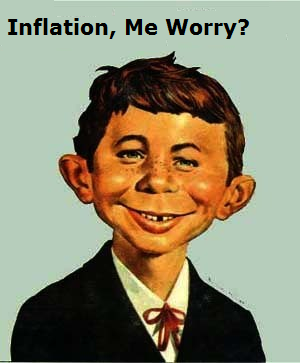 As QE winds down next month, minds are turning to the forward guidance. Our guess is that either at this meeting or the one in December, the next two occasions with a press conference from the Chair, will be when forward guidance is adjusted. As of last June’s meeting, the members of the FOMC anticipated Fed Funds rates, currently around 0.1% to rise to around 1% by the end of 2015. Usually, the Fed likes to move gradually so one plausible path which is consistent with the Fed’s published material, would be to raise rates by 0.15% in the middle of next year, and by 0.25% each of the next three meetings. This scenario is inconsistent with continuing the FOMC statement which last read “it likely will be appropriate to maintain the current target range for the federal funds rate for a considerable time after the asset purchase program ends.” What is a considerable period? Chair Yellen said about six months at her last press conference. If we put all the pieces together, they add up to the removing that language from its statement sometime soon. However, last year’s taper tantrum showed that the fixed income market can overreact to Fed intentions. In sum, the Fed has a communications problem: to let the market know that even considerable periods of time must end while minimizing bond market gyrations. Best to stay alert for market disruption around and after the press conference, next Wednesday, September 17. Will the fed be aggressive in raising rates? The Fed still has the substantial policy dilemma we have covered in the past (here and here, for example). 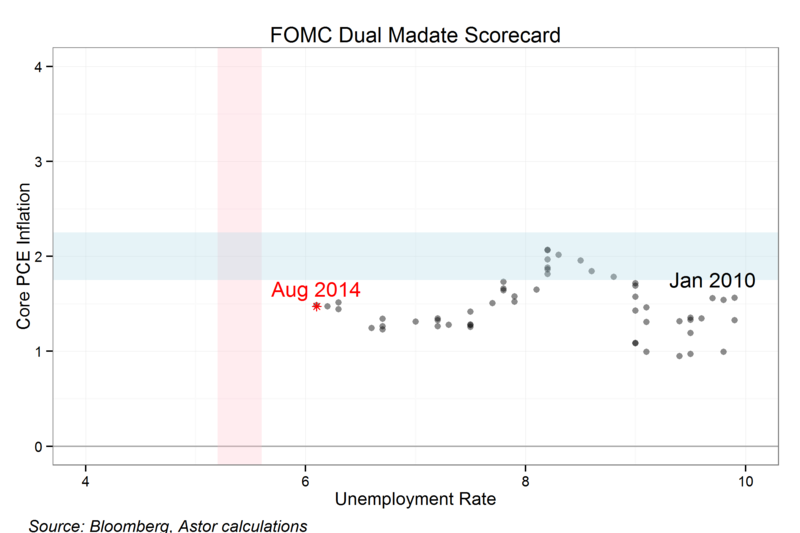 We will update here our Dual mandate Report Card showing that the Fed is still in the happy situation where there is no conflict between encouraging the labor market to improve and maintaining price stability. There is a great deal of discussion, however, about exactly how much slack is in the labor market. Specifically, how many of the millions of Americans who dropped out of the labor force since the financial crisis can be enticed back in? Aging population means that many workers have retired and are not seeking new jobs. Chair Yellen’s speech in Jackson Hole was not quite as dovish as I had anticipated giving more credence to the idea that a good part of the reduction in the percentage of the population working or looking for a job permanent. See this report by Stephanie Aaronson and her colleagues at the Federal Reserve for one careful study which estimates that only 1/4 to 1 percentage points of the 3 percentage point drop in the labor participation rate will be recovered. I will agree with Cardiff Garcia (here, for example) that given the low levels of current inflation, the stability of inflation expectations, long-term under shooting of the Fed’s inflation target and a weak global growth environment, the safest thing for the fed to do would be to allow rates to remain low until they can find hard evidence of higher inflation. See also Gavyn Davies take. I agree that changing the “considerable” language in December makes the most sense and that is what I would vote for. I do wonder, however, if Chair Yellen will attempt to prepare the ground for next quarter’s change in this quarter’s press conference. The first week after month end is always full of data. I have a lot to cover. 1. ISM Manufacturing: 59 vs. 57 est. Another great report from the manufacturing industry. The underlying data sets remain well above the 50 mark which signals continued growth and several saw increases. Notably, new orders boomed to 66.7 and production is now at 64.5. The economic beast is slowly awakening. Additionally, on an inflation note, the prices paid index dropped slightly to 58. A cooling in the index gives the Fed a bit more time, but it still remains relatively high so the timeline could be getting squeezed. 2. Nonfarm Payrolls: 142K vs. 230K est. And the streak is broken…We are now back under the 200K mark in payrolls. Many had expected a strong showing for manufacturing, however, employment was unchanged. Gains were seen in construction, health care, and services (17K of which was temp). As always, I expect to see revisions for the August number in subsequent releases. If the revisions bump the number up into the 170-200K range, we can consider it to be a minor blip in an overall positive trend. The participation rate fell again to 62.8% as more workers left the work force. Unemployment now stands at 6.1%. There was evidence of wage growth with hourly earnings rising 2.1% YoY. 3. Unit Labor Costs: -0.1% vs. 0.5% est. Productivity was up 2.3% which was below initial estimates. Growth in manufacturing was much higher at 3.3% while labor costs fell during the quarter. The threat of runaway inflation is just not there yet. I would like to see a pickup in productivity if we expect the economy to continue posting 3-4% growth. 4. ISM Non-Manufacturing: 59.6 vs. 57.7 est. Not one to be outdone by manufacturing, the services industry also put in a stellar report. Employment moved higher to 57.1, business activity shot up to 65, and new orders fell a bit to 63.8. Services have remained above 50 for nearly six years and do not look to be stopping on the march forward any time soon. As was also seen in the other ISM report, prices paid fell in August but still remain higher. In summary, the future looks bright. Factory Orders: 10.5% vs. 11.0% est. Trade Balance: -$40.5B vs. -$42.4B est. Vehicle Sales: 17.45M vs. 16.6M est. The trade deficit narrowed, vehicle sales were much better than anticipated, and factory orders were mostly in line with expectations. I could get more in depth but suffice to say these numbers are further evidence of a economy making strides. The S&P 500 is creating a nice little trading range for itself (1995 to 2005). 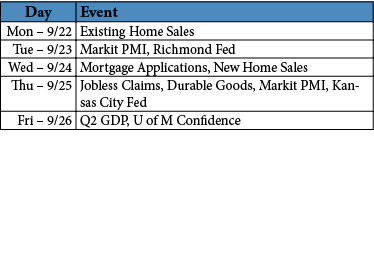 The two main non-domestic influences on stock prices last week were Ukraine and the ECB. Flare ups in Ukraine initially brought out some sellers, but a late week cease fire agreement soothed concerns. The ECB enacted a bond buying program similar to QE in the hopes of boosting activity in the eurozone. Stateside, positive economic news and a disappointing payroll number kept us steady. Traders were adjusting to the end of summer, a short week, and the start of the year end grind. 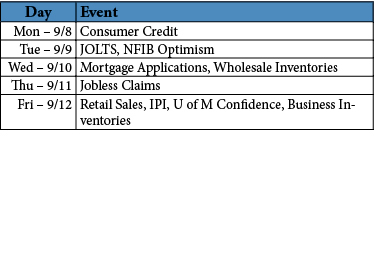 A little calmer on the economic front this week with focus likely on retail sales after a flat month in July. Traders’ antennae are slightly more alert after the NFP number, but there should not be much worry. A few inventory numbers may give a tad more information for GDP. Although with a 4.2% Q2 print, even a downside revision of 0.5% would likely elicit a shoulder shrug at best. Can we push higher? Volatility is non-existent and volume should be returning after the summer doldrums. Allow me to talk out of both sides of my mouth for one second. September could be ho-hum or it could get interesting. I personally think there is enough to support higher asset prices, but a trade below 2000 on the S&P every now and then would not be the worst thing to happen.